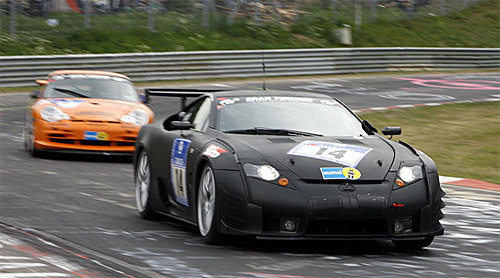 The Lexus LF-A racing prototype finished the Nürburgring 24H race in 121st place, mostly due to some extended pitstops. Over the 24 hours, the LF-A managed 100 laps, 48 back of the winning Porsche 911 GT3 RSR. Did you get anyone to talk to you about the Lexus?” That was the question of the weekend as the primer-black V-10-powered Lexus LF-A made its way up and down the leader board at the 24 Hours of Nurburgring. It’s obvious that Toyota has used this race as a hide-in-plain-sight endurance test for its 2011 model year Lexus sports car. When I approached a driver, as his co-driver took the cool-down lap, he tried to pass me on to a translator. No good. All I could do is get him to say it’s a V-10. It finished 134th, completing 100 laps, or 1,750 miles.